The central govt. of India has introduced the new pension scheme i.e. Pradhan Mantra Shram Yogi Mandhan (PMSYM) for Labour/ Worker in Unorganised Sector. This pension scheme is announced by Union Finance Minster Piyush Goyal in this Interim Budget 2019-20. The scheme is for informal sector or unorganised sector workers. Subscribers to the scheme are assured of a monthly pension of Rs. 3000 per month after they reach 60 years age. The subscribers have to pay a monthly amount of Rs. 100 if the subscriber joins at age 29 and Rs. 55 if the subscriber joins the scheme at 18. The same amount will be matched by the government. The scheme is estimated to benefit 10 Crore workers from informal sector. The government has allocated an initial fund of Rs. 500 crore for the scheme. What Constitutes an Unorganised Sector? The unorganized sector in the country constitutes unincorporated entities having less than 10 workers and is owned by individuals or households. The sector also includes people working independently in non formal work which needs minimal skills. The sector contributes over 50% to the Indian GDP. Why The Scheme Is Important? It is estimated that over 42 corer workers in India are working in the informal sector. As per the India Labour Market Update of 2016, 82% of the Indian workforce is in unorganised sector. The workers of the sector include street vendors, rag pickers, porters, beedi workers, rickshaw pullers, agricultural labourers etc. The nature of their job and the income they receive are not stable. Often due to non availability of any laws to protect their interest, they are subjected to violation by the employers. This uncertain earnings puts pressure on them financially and need some kind of monetary protection to lead a life with means after their productive years. 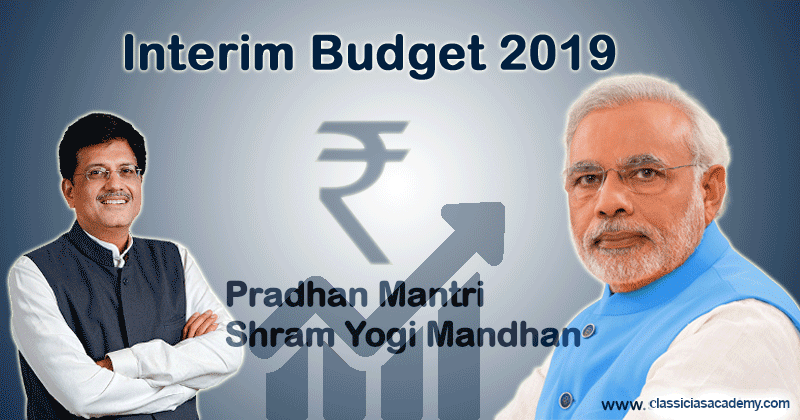 It is why social security schemes such as Pradhan Mantri Shram Yogi Mandhan (PMSYM) becomes necessary where the government is contributing in the premium amount. Critics say that the informal workers in the country are already burdened with low incomes and high indirect tax. For them, making voluntary contributions to the scheme is a difficult task. Unlike a salaried person, for whom the pension amount is cut from the salary, a migrant worker need to deposit the amount every month which is not possible for them. Also, many other details regarding the scheme like what will happen to the money in case of skipping of payment by the beneficiary etc. How is the Scheme Different from APY? The Atal Pension Yojana (APY) was launched in 2015 targeting the unorganised sector. For the scheme, citizens between 18 and 40 years of age are eligible. The scheme provides fixed pension slabs in the range of Rs. 1000, Rs. 2000, Rs. 3000, Rs. 4000 and Rs. 5000. The contribution of the subscriber varies depending on the slab he/she chooses and the age at which the subscriber is subscribing for the scheme. In this scheme, there is no contribution to the premium from the government. The scheme do not allow for premature exit and withdrawal of money. Money can be withdrawn only in the case of the death of the beneficiary or terminal disease. Instead of doling out schemes such as PMSYM, the government has to take more measures to formalise the economy. It must ramp up skilling of the workforce, take steps to generate more jobs in the formal sector, change labour laws to include informal workers etc. It will in effect provide wage protection, job security, social security to the workers and ultimately alleviate the hardships they face. Eventually it will boost the overall economic growth of the country. Disclaimer: The content on this News Page is a compiled result of Classic IAS Academy Research team and This NEWS related to governmental New Scheme.